Fit-Ink: Bo Jackson Knows Bikes? Bo knows football. Bo knows baseball. Bo knows basketball, tennis and running. Remember those ads from the early 1990s where Bo Jackson played his fortes--baseball and football--and then tried his hand at other sports from cycling to surfing? Bo probably didn't expect that he'd be almost as knowledgeable about bikes as he is about football and baseball 20-something years after those ads went off the air. But if you're going to ride 300 miles across Alabama, like Bo did earlier this year, you kind of have to (maybe not the mechanics, but you get the idea). Bo is bringing that knowledge and some bike safety tips to the Trek Store of Highland Park later this month. Trek, located at 1925 Skokie Highway, will be hosting the Heisman Trophy-winning athlete from 5:30 p.m. to 8 p.m. on Thursday, August 30. Bo will share his bike safety tips alongside Robbie Ventura, talk about the ride he did across Alabama aptly called Bo Bikes BAMA, sign autographs, take pictures, and talk some football and baseball. With Mike Adamle emceeing the event, you'd expect to hear about some gridiron greats, but that also means some football memorabilia will be auctioned off with the proceeds going to Bo Bikes BAMA. Bo Bikes BAMA. Catchy isn't it? That's what Bo dubbed his 300-mile ride across Alabama to raise money for the tornado victims in his home state. He got some training aid from Robbie Ventura and Christian Vande Velde back in December--they were cool as cucumbers on that wintry day while Bo was sweating up a storm. Then as he rode across Alabama, Bo was joined by Lance Armstrong, Scottie Pippin, Ken Griffey, Jr., and thousands of other people riding along to support him. 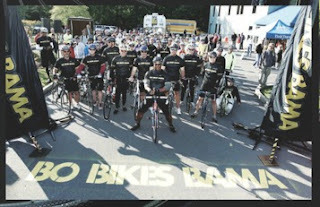 As a result, he's raised more than $600,000 for the tornado relief, but Bo Bikes BAMA still wants to raise more. To show your support, you don't have to do anything but RSVP to attend this free event (and while supplies last, you'll go home with an autographed postcard). But if you want to do more, you can bid on those Bo collectibles at the auction, make a donation to Bo Bikes BAMA, or donate $30 for VIP access to get an autographed picture with Bo. And maybe he'd even autograph a football or baseball card? If I could convince my cousin to attend (and he's not a cyclist by any means), I can almost guarantee that he'd go through the boxes in his basement to find his old Raiders memorabilia for Bo to sign. For more details and to RSVP, check out the information on the Trek Store's page.